Our greatest enemies are not wild beasts or deadly germs, but fears that paralyze thought, poison the mind, and destroy character. Our only protection against fear is faith. The testimony of God's faithfulness through a recent frightening and humiliating experience: getting my driver's lisence. Three and a half pages of comments and encouraging feedback from HW readers, including seven photos. "How can I make a fresh start when I have really blown it with my speech or behavior?" Six insightful answers to this important question are shared in this issue. 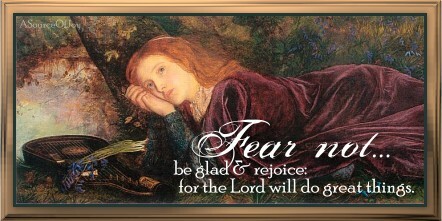 Jennifer uses Scripture to show the difference between harmful fears and proper fears, including the fear of the Lord. Meghan shares encouragement to those who are struggling with the fear of man, reminding us to stand firm and not let Satan have the victory. Mrs. Y. brings out how our "vision" of God affects our fears; she also shares insights and promises from Psalm 91. This two-page collection of thematic quotes and poems will give you much food for thought. "What is God's plan for my life?" David shares how asking God this question with the right motives will help us face the future with faith instead of fear. In this glimpse of "life on our side of the magazine" you'll read about our grandparents' 55th anniversary and the story of how God brought them together; some of our recent driving adventures, Susanna's trip to Indianapolis, and our time of fellowship with visitors from Canada. Includes a selection of photos from the last two months. In this first installment of her new column, "Let the Little Children Come," Meghan introduces us to her ministry to children on a South Dakota Indian reservation. Erin takes this opportunity to introduce us to her 15-member family and share some of the adventures God has brought them on over the last few months. Includes photos of her and her siblings. Are you looking for practical tips on sharing your faith with those God brings into your life? Lindsey shares the importance of basing witnessing on God's law, the Ten Commandments. Are you seeking Christ with your whole heart? What is your heart's deepest desire? Sharia challenges you to examine your own heart and seek Christ alone. Christina shares what God has taught her over the past year about waiting on His timing and not becoming impatient when things don't go as we'd hoped. In this issue Mr. Johnson M., a subscriber from Africa, introduces himself, his family, and the ministry God has given him at a local girls' school. Sarah tells of the peace and direction God gave her after she surrendered fully to His will, saying that she would serve Him as a missionary. Do you understand the differences between various piano-teaching curriculums? Emily explains each type and gives advice on selecting the right method for each of your students. Cookies, candy, snacks, and more fill the recipe column in this issue: you'll want to give them all a try! HW food editor Katherine N. put together this selection of readers' favorites. Nine items fill this page, including penpal ads, music and website recommendations, help-wanted ads, and more! This issue's daily Bible readings are taken from the books of Acts, Romans, 1 and 2 Corinthians, Galatians, and Ephesians. Thematic weekly memory verses are also included, along with a handy space for listing prayer requests.